Mrs.Ethelston's is a Voluntary Aided Primary School, organised within the principles and doctrines of the Church of England. Children of both sexes are admitted between the ages of five and eleven, although provision is made for children who are 'rising fives', i.e. those who will be five during their first or second term at school. Mrs Ethelston's Primary School has close and happy links with St Peter and St Paul's Church. Our five-class school is still housed in its original building, together with more recent additions to cater for the current numbers. It is situated in the lovely village of Uplyme which adjoins Lyme Regis, the sea front being just one mile away. 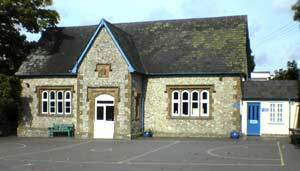 Although it is so close to the Dorset border, the School is nevertheless still within the Devon Education Authority area. We have close links with other local primary schools in both Dorset and Devon, and we are a feeder school to The Woodroffe School. Mrs Ethelston's is very much a community school and although the children come from a wide area, they are encouraged to feel involved in village affairs. We also like to feel that the people of Uplyme are involved in and supportive of our School. The School is named after Mrs Anne Ethelston, who was born in 1799, and was the wife of the Reverend Charles Wicksted Ethelston. After her death in 1854, Reverend Ethelston decided to erect a building in his wife's memory to house the already existing school. Sadly, the main building was not opened until 1873, a year after Reverend Ethelston's death. After an inspection in Summer 2008, the school was described as OUTSTANDING. "This is a good school, with several very good features, providing a good quality of education. Standards at the end of Year 6 are above national averages and pupils� achievements are good. The quality of teaching and learning are good and the school is very well led and managed by a highly dedicated headteacher. Governance is good. The school provides good value for money".